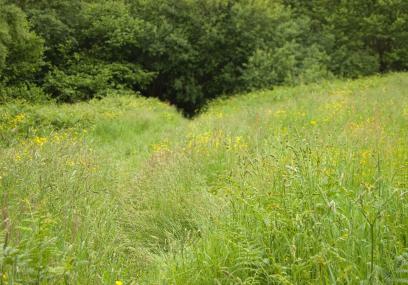 This small urban reserve comprises a meadow and a small area of oak woodland. It is a good site for birds, butterflies and other insects. The woodland is part of a larger block of woodland, the remainder of which is managed by the local authority. The woodland is ancient, a relict of the countryside that covered the area before the New Town was built. Flowers in the meadow include bird’s-foot-trefoil and common knapweed. The common knapweed’s purple blooms provide an important food source for nectar-feeding insects in summer. Butterflies such as meadow brown and small skipper can be seen, along with a range of beetles and hoverflies. Around the edge of the meadow, planted species include dogwood, with its brilliant red stems providing a fine display in winter, and field maple. The meadow is fringed by tussocky grasses, creeping thistle and bramble. An annual hay cut keeps the coarser species in check, allowing more delicate grasses and flowers to survive. The woodland includes oak, ash and some large birch trees. Resident birds include nuthatch and treecreeper. The blackcap’s gorgeous song can be heard in spring, whilst the wood rings to the twittering and flutey whistling of siskin in winter. The paths within the reserve are on flat ground, but uneven. There is one flight of steps. From Cwmbran town centre (Sainsbury’s roundabout), go south along the A4051, Cwmbran Drive, towards Newport. At the 2nd roundabout on Cwmbran Drive take the 3rd exit, right onto Hollybush Way. At the next roundabout turn left along Hollybush Way. Go straight across the next roundabout onto Penylan Way. Coed Meyric Moel lies on the left hand side, about 600 metres along this road. To park, continue along Penylan Way past the wood to a roundabout and turn left onto Henllys Way. Then take the 2nd left at the brow of the hill to park in Tramway Close. The reserve is reached by joining the footpath (The Incline) on the right that runs along the northern side of the wood (grid ref: ST 271 941). Henllys Bog, Dan-y-Graig and Branches Fork Meadows. The Monmouthshire and Brecon Canal runs south through Cwmbran, reaching the Fourteen Locks Canal Centre near the famous Cefn Flight of locks. The hills of the South Wales coalfield rise behind Cwmbran. They are rich in archaeology, from remains of recent coal mining and iron scouring, to the ruins of the Celtic chapel of Llanderfal and the Iron Age hill fort of Twmbarlwm. Roadside parking only in Tramway Close.